Lady Eli #9, ridden by Irad Ortiz Jr., takes the track before the start of the Breeders' Cup Filly & Mare Turf on Day 2 of the 2017 Breeders' Cup World Championships at Del Mar Thoroughbred Club on November 4, 2017 in Del Mar, California. Multiple grade 1 winner Lady Eli has been retired from racing and will be bred to War Front in 2018, owners Sol Kumin and Jay Hanley announced Tuesday. The 6-year-old mare by Divine Park x Sacre Coeur (by Saint Ballado), won 10 times from 14 lifetime starts, finishing second in three additional races. She earned $2,959,800 during her racing career. 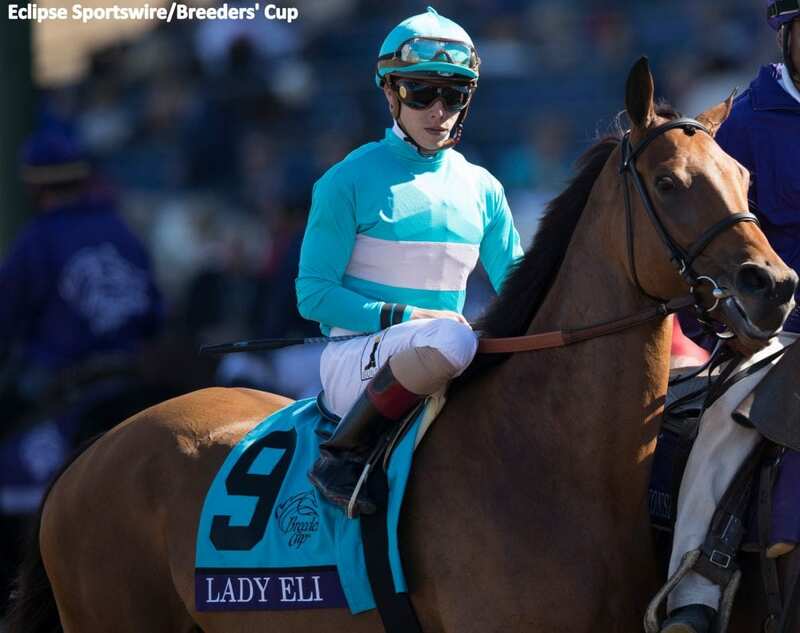 “We have been wrestling with the very difficult decision of whether to race or retire Lady Eli since we scratched her from the Keeneland November sale days after she was injured in the Filly & Mare Turf,” Kumin and Hanley said in a joint statement. This entry was posted in Bloodstock, NL Article and tagged Chad Brown, Horse Racing, lady eli, sheep pond partners, sol kumin, thoroughbred, war front by Edited Press Release. Bookmark the permalink.